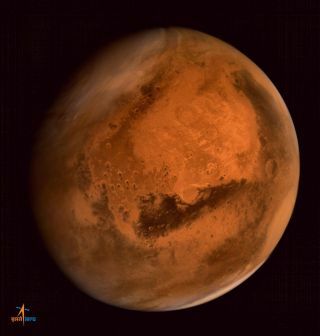 Mars in all its beauty as seen by the Indian Space Research Organization's Mangalyaan spacecraft in orbit around the Red Planet. Time to tune up your telescopes! Mars is at its closest to Earth in 11 years on Monday (May 30), providing a great closer to Memorial Day events. Even if you're too busy doing other things that night to gaze at the Red Planet, you'll still get a good chance for at least two weeks. While Mars is technically at its closest on Monday at 47.2 million miles (76 million kilometers) from Earth, it will remain closer than 48 million miles (77.2 million km) up until June 12. If bad weather threatens to spoil your Mars experience on Monday, you have a back up. The online Slooh Community Observatory will offer a free live webcast of Mars with its remotely operated telescopes. You can follow the webcast at Slooh.com, beginning at 9 p.m. EDT (0100 GMT). You can also watch the Mars webcast on Space.com here, courtesy of Slooh. Mars and Earth periodically come close to each other every 26 months, but the distance of the closest approach varies because both planets have elliptical orbits. According to Space.com skywatching columnist Joe Rao, Mars was even closer in 2003 because it was at opposition — when the sun, Earth and Mars are in a straight line in space — just 42 hours before it reached its closest approach to Earth. Mars hadn't been that close to Earth in 60,000 years. "Perihelic oppositions" of Mars, when Mars is at its closest to the sun and Earth at the same time, only take place about every 15 to 17 years, Rao added. Luckily for skywatchers, the next one is around the corner; Mars will be even brighter and closer than this year's approach in June 2018. The planet is so bright during its closest approach that you can see it with the naked eye. All you need to do is look at the constellation Scorpius low in the southern sky (in the Northern Hemisphere). Mars is above Scorpius' brightest star Antares, which is called the "rival of Mars" because sometimes the Red Planet passes close by to the star. To the left of Antares is another planet: Saturn, which glows white. You can easily tell the planets apart from the star because they won't twinkle as much. The Earth's atmosphere distorts the star's light because it far enough away to appear as a single point. Mars will appear as a brighter red dot in binoculars. With a large telescope, it will be a challenge to pick out features such as its ice cap or clouds, but sometimes amateurs pull up amazing imagery using a combination of good seeing and good computer software. Mars is actually outshone right now in the sky by the planet Jupiter, which is flying high in the southwest. While Jupiter is farther from the sun, it is brighter because it is 20 times larger in diameter than Mars, the Sky & Telescope statement said. Editor's note:If you snap an amazing photo of Mars and would like to share it with Space.com and our news partners for a possible story or image gallery, send images and comments to managing editor Tariq Malik at spacephotos@space.com.